The Big Parade (1925): the highest-grossing silent film of all time. 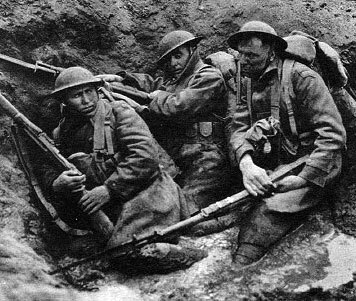 I recently watched the 92-year-old silent film The Big Parade, King Vidor’s 1925 epic that stunned American audiences with its depiction of the horrors of trench warfare in World War I. The story, backed by a magnificent score in the restored film, follows three men—a bartender, an ironworker, and a wealthy member of the elite—swept up amid the patriotic fervor of 1917, with its brass bands and jubilant parades and adoring girls. The men enlist and are transformed from undisciplined civilians into soldiers marching smartly in line. They deploy to Europe and are billeted in a country village safe behind the lines, where they indulge in the usual hijinks of bored young soldiers, stealing French wine and romancing French girls. The film, so far, is a familiar story of boys in uniform, almost a comic adventure. Then they are ordered to the front. The journey begins in a miles-long convoy of exhaust-spewing trucks. Then they march. By nightfall, they arrive at a nightmare landscape of stripped trees, raw earth, shell craters filled with foul water, coils of barbed wire, machine gun nests, and the rain of artillery shells. The men die one by one from snipers, machine guns, and shrapnel. The film manages to convey the obscenity, terror, brutality, and torment of the war about as well as a film can. The one thing film can’t capture is the smell of putrefaction in No Man’s Land, where thousands of corpses—mostly British, French, and German young men—decayed in the mud where they had fallen. I watched The Big Parade to prepare for a talk I gave last month at an event titled “The Experience of War: from World War I to Iraq and Afghanistan,” hosted by Timberland Public Library in Centralia, Washington. This year marks the centennial of the Armistice on November 11, 1918. American troops, late entries to the conflict, fought on the front lines for the last six months of the war. Some 53,000 Americans died in combat, about nine thousand per month. Over ninety thousand were severely maimed. Although a century has passed, and the weapons of war have evolved spectacularly, the life of an infantryman remains unchanged in many respects. War is eternally exhausting. War is deprivation. War is mud, dirt, dust, and filth, frostbite and heatstroke. War is love between brothers in arms. War is raw fear. War is mangled bodies. War is dying. For those who survive there is no escape, ever, from the memory of war. 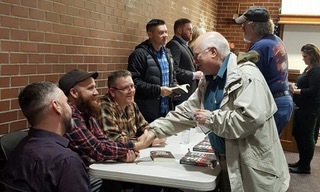 Six veterans whose stories are told in What They Signed Up For: True Stories by Ordinary Soldiers participated in this event, sharing their experiences in Iraq and Afghanistan. They were Dennis Eller, Mike Farnum, Brandon Mitalas, Joe Stone Sr., Robin Eckstein, and Dominic Wilkerson. Like the veterans of World War I, they deployed thousands of miles away from parents, wives, and children. They fought in blistering desert heat and snow-covered mountaintops. They saw the deaths of soldiers and civilians, the destruction of cars and houses, the blood of Americans, Iraqis, and Afghans. L to R: Joe Stone Sr., Dominic Wilkerson, Mike Farnum, Dennis Ellser, Brandon Mitalas, and Robin Eckstein. The patrons of Timberland Public Library listened politely to my lecture and perhaps learned a little history of World War I. I expect them to forget much of what I said, as most audiences will. What I think will be indelible in their memories will be the testimonies of Dennis, Mike, Brandon, Joe, Robin, and Dominic of their experiences as veterans. World War I began a century ago with parades and brass bands and the myth of the gallantry, patriotism, heroism, and glamor of war. The nation drank deeply of propaganda. German-Americans, labeled domestic enemies, were vilified, and in some cases literally tarred and feathered. Surely we could find parallels with our current wars. But perhaps not enough time has yet passed for us to peel away the same myths that color our national experience of war. Perhaps we are still searching to understand their human significance and for the language to express them. The veterans of Iraq and Afghanistan, however, have already stripped away those myths. They have found the language to express their experiences of war. I’m grateful to Timberland Public Library and its patrons for being willing to listen to them. Jeb Wyman is the editor of What They Signed Up For: True Stories by Ordinary Soldiers, published by Blue Ear Books.